There's no need to leave your four-legged friend at home. We list our favourite dog-friendly pubs in London. 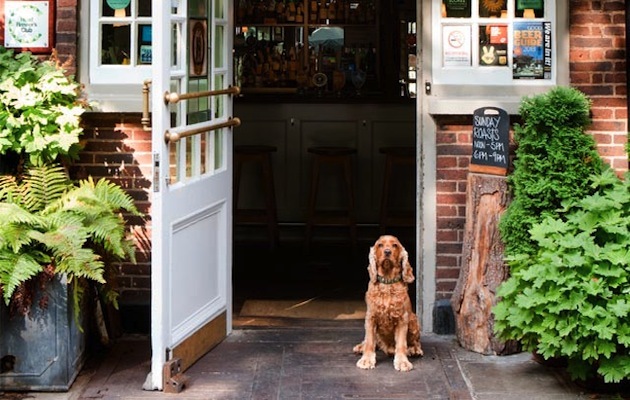 There are some brilliant walks for lazy afternoons in London, and if you’re taking the dog you might plan in a visit to one of these great dog-friendly pubs, whether you’re rosy cheeked from a walk on Hampstead Heath or Richmond Park. They are relaxed, easy-going places with good food and drinks, and plenty of cosy corners to curl up in. You can tuck into a roast with all the trimmings here every Sunday until 9pm – perfect after a blustery walk on Clapham Common. Your dog will be making eyes at the roast Orkney beef topside with Yorkshire pudding, but with biscuits and water bowls available on request, they won’t feel too left out. 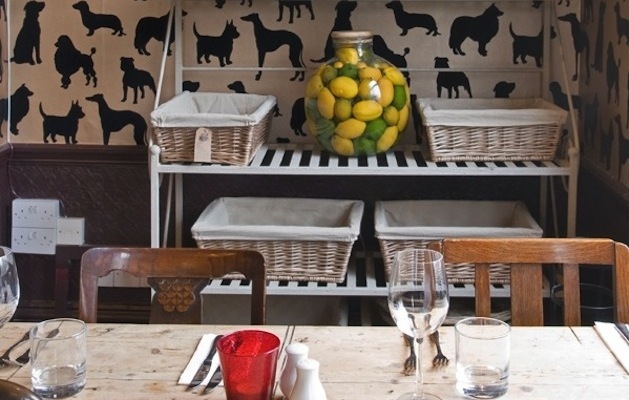 The doggy decor here give you a clue to where the owners’ hearts lie – the walls are covered in pooch-print paper. Four-legged friends are welcomed with open arms, and there’s a regular crowd of well-groomed dogs on leads who come in with their owners after a lunchtime constitutional in Battersea Park. One of London’s finest and friendliest gastropubs – people come from miles around for the venison Scotch eggs, and it’s particularly good for large groups. Well-behaved dogs are very welcome, and the staff will sort you out with a water bowl. ‘We welcome friendly dogs, well behaved children, and their owners,’ reads The Red Lion’s website. House dog Sylvester is on hand to greet visitors, and the staff take photos of all the dogs that come in regularly. The food is fantastic (particularly the steak and chips), and everyone gravitates towards the log fire after a wintery walk on Hampstead Heath. A short walk from the Thames in one of the prettiest parts of Barnes is this independently owned pub. It’s the perfect place to stop off on your way home from a morning in Richmond Park, serving hearty dishes like chicken-and-chorizo pie and gourmet burgers. It gets busy on weekend, so you might want to book to bag the best spot for you and your dog. And if they’re really lucky, they might get some pigs’ ears as a special treat – ask at the bar.